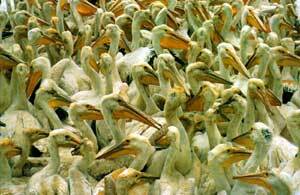 Library image #2: Colony of American White Pelicans. The United States Congress designated the Chase Lake Wilderness (map) in 1975 and it now has a total of 4,155 acres. All of this wilderness is located in North Dakota and is managed by the Fish and Wildlife Service. If you were to tally up all of the white pelicans that nest on two islands in this isolated alkali lake, you'd find more than 20,000, one of the largest colonies in North America. That figure is all the more impressive (and heartening) when you consider that only 50 birds inhabited the region when the area was officially slated for protection in 1908. Birders may observe these creatures from a rise near the lake, but the islands themselves are strictly off-limits. In addition to pelicans, you may encounter ducks, geese, swans, sharp-tailed grouse, ring-necked pheasants, gulls, cormorants, white-tailed deer, and many smaller mammals. Facilities are not available on site, and camping is not permitted. The Chase Lake National Wildlife Refuge is 95% wilderness. Only about 230 acres, separated from the rest of the refuge by a powerline, are not. The lake itself takes up more than half of the area; the remaining acreage is grassland and wetland with very few trees. Planning to Visit the Chase Lake Wilderness? How to follow the seven standard Leave No Trace principles differs in different parts of the country (desert vs. Rocky Mountains). Click on any of the principles listed below to learn more about how they apply in the Chase Lake Wilderness.